They greatest threat to our nation is the lying socialist media and their ongoing propaganda campaign against the people of this nation that continues to give cover for traitors in our government that wish to end the U.S. as we know it. If the media would stop lying and report the truth, 85% of American's would wake up and rise up and stop the open borders agenda, the Trump coup, abortion on demand, the Fed, globalism, climate change, etc., etc.. In this instance, if the media would actually fairly interview, and I mean a real interview, these angel mom's and dad's as well as the border patrol about the truth of what goes on and what comes across our borders, Nancy and Chuck would be run out of town on a rail....and shamed for there traitorous acts the whole way out. -W.E. 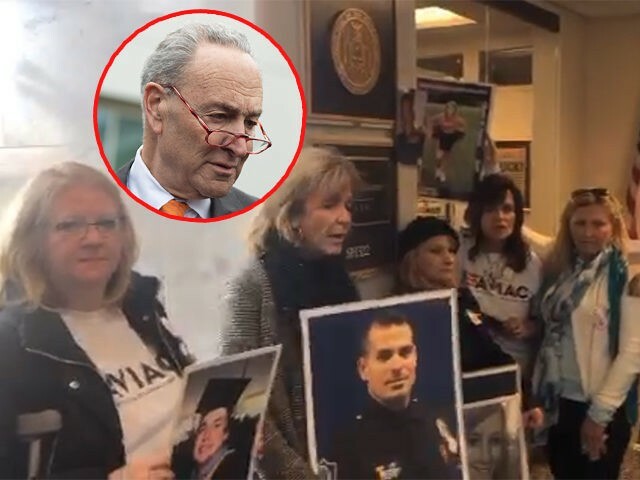 A group of Angel Moms on Tuesday are protesting inside Senate Minority Leader Chuck Schumer’s (D-NY) Capitol Hill office over the Democratic leader’s refusal to support legislation to fund a U.S.-Mexico border wall as the partial government shutdown continues. Earlier Tuesday, the Angel Moms protested inside the office of House Speaker Nancy Pelosi (D-CA), who refused to meet with the group, and were reportedly lied to about the Democrat leader’s whereabouts. Earlier Tuesday, Women for Trump, held a press conference in Washington, D.C. for border security with families who have lost loved ones to the opioid crisis and crimes committed by illegal aliens. The event, which was held at the Capitol Triangle on Capitol Hill, was attended by Rep. Louie Gohmert (R-TX) and former ICE Director Tom Homan.